Offers refreshment to eyes that appear tired, puffy or red. This soothing herbal solution reduces the appearance of puffiness in the skin around the eyes and comforts eyes exposed to pollutants and irritants. Eyes look and feel refreshed, revitalized and relaxed. Each box contains 10 soothing treatments. 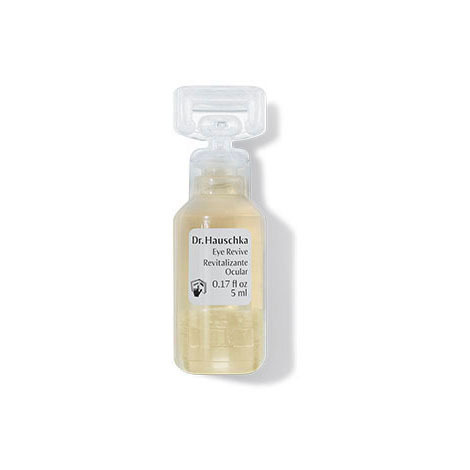 Formulation: Extracts of eyebright, anthyllis, chamomile and camellia comfort eyes, while fennel extract soothes skin and visibly diminishes puffiness. I used one of these expecting just some temporary depuffing around my eyes and maybe to correct a little redness in my eyelids, but when I took the pads off my eyes my actual eyeballs were so bright white and refreshed. I didn't expect such a dramatic reduction in the redness in my actual eyes! It has been about a week and my eyes are still brighter and less red than usual. Immediately bought more of these. Recommended!!! already bought 6 boxes in a year. worth every penny! This is the very best eye relief product that I've ever used. It never irritates my eyes like all other products that I've used on my eyes do. Try it!! Works for tired or irritated eyes. Helped my eyes recover from jet lag. I have used this product on numerous occasions and always with pleasure. Be sure to have a little time set aside, soak the solution onto two cotton pads, lay down and place them on your eyes. Put on some nice music and relax for about 20 minutes. It is rejuvenating and brings down swelling a little bit too. Really lovely! This leaves you feeling really fresh and clean after using it. Plus mini spa day = happy day. This product is quite good for tired eyes it’s gentle to the skin. It was relaxing and felt very cooling on my eyes, but I could see no discernible difference in puffiness afterward. Also, I'm not sure why, but I was under the impression the cosmetic pads mentioned in the usage instructions came in the box with the ampules, but they don't. So make sure you have some on hand. Sorry to hear you are not 100% satisfied with your purchase. Your purchase should have included the cosmetic pads, please give us a call at 800-247-9907 9am-noon and 1pm-4:30pm Eastern Standard Time, Monday through Friday. My new little beauty secret! used on very tired eyes and what a difference! My eyes (&me) feel so much better, refreshed and smooth. Didn't do much with puffiness though. A real threat that small ampule. Wish it was also available in a bigger (spray?) bottle ?? I normally just splurge on basic skincare and makeup, but really wanted to try this product. I was so happy I did. It was so soothing to my dry itchy winter eyes. Thank you. I got a sample of this product and I thought it made my skin feel very soft and refreshed. I used it before bed, which seemed like a perfect time since it does make your eyes feel more relaxed (especially after having them closed during use!). I love to take this with me when I travel. It helps me to avoid those puffy, red eyes that I get when I spend too much time in airplanes or after too many sleepless nights. I notice a difference after one use, and a few days of this product, and I look younger and more refreshed. The only time I have a problem is when I fail to put it into my make up bag before hitting the road! 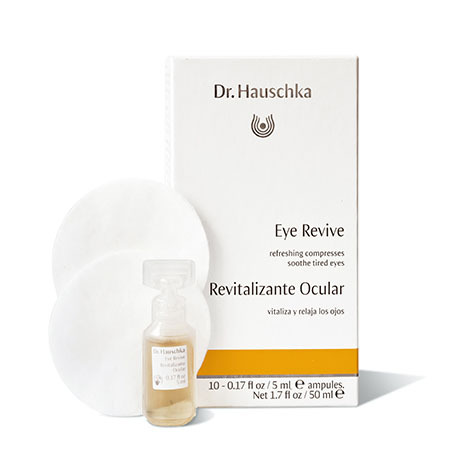 This product does an amazing job with refreshing and soothing my eyes. I use it as an overnight treatment and it does wonders overnight, I wake up with well-rested, fresh-looking skin around eye area. After a long flight I use this product and take a quick nap. It feels so refreshing! I would recommend to anyone with puffy eyes after staying up late or just a long day. I love the mild, but effective formula in this, it wakes up my eyes and I do notice slight visible effects in the overall eye area. Unfortunately I still have some slight puffiness under my eyes, but it does alleviate a lot of it and eye puffiness is hard to address. This product is great because it soothes my eyes from hurting from lack of sleep or computer-use. Looking forward to continued use, I plan to use it regularly! Eye revive smells and feels amazing ! It soothes my dry eyes and makes them feel refreshed . I used it for the first time last evening. I have sensitive eyes and was hoping this would soothe them. I took a pad, and treated it with one single ampule ..... 1/2 on each eye for 10 minutes... both eyes closed. My eye lids looked a little red so I patted them with a damp cloth to remove any excess solution. Woke up in the morning and the lids looked a little irritated. I don't think the directions on the carton was clear enough. Maybe I applied it wrong.... did not get it on or in my eyes. Please advise. 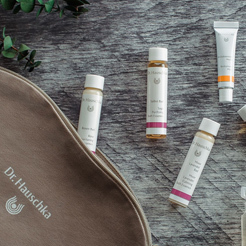 I love Dr. Hauschka products especially Rose Cream for Rosacea and face make-up, Transculent 01. I didn't notice any difference regarding my puffy eyes, it didn't work well for me. Great for looking your best. Did wonders for my sisters and I before a wedding. Leave on for 10-15 minutes. Great gift for those who suffer with puffiness or dark circles. Helps decrease the puffiness you get from working late, studying late, and just lack of sleep overall. The Eye Revive has helped me to calm my irritated eyes after air travel. As you put the soaked pads on your eyes, just breathe in the relaxing scent. I am not sure if this product works since I used just once and I don't see any difference. Maybe if it's used for a week or so you may notice a change. Thank you. I love the light rose cream though! Wonderful! I used this on my last trip to Paris. A nice pick me up, a treat, but not life-changing. I also didn't like the little plastic bottles. Felt wasteful. After reading the great reviews, I had hoped this product would lessen my under eye bags and circles, but after a few uses I see no difference. Several times it has caused some blurry vision which has really scared me and makes me not want to try it again. Sorry to say I wont be buying more. I’m so sorry you had a bad experience with our Eye Revive. Our products are made with high quality natural and organic ingredients but occasionally a product is just not compatible. To determine if your reaction was caused by an allergy or if there might be a problem with the product would you be willing to provide us with more information about the product and your experience? I can also help arrange a refund or credit if you have not already received one from the retailer where purchased. I've emailed you directly, but please feel free to contact me by phone at 1-800-247-9907. I had used this product many years ago and was thrilled to find it on the website. I have dry eyes and Eye revive really refreshes my eyes after a long day on the computer. Helps eyes look brighter and less puffy after jet lag. This is a great product for tired looking eyes. I use this after flights and long days of work to get a refreshed look. I used it before bedtime, and the minute I put it on, it made me relaxed and fell asleep! The scent is therapeutic! Eye revive was very soothing. Great for tired, puffy eyes or as a treat to yourself !! I use this product whenever I wake up with puffy, tired eyes. Very soothing and works wonders. Use at home or on the go while traveling...... Easy to use, easy to pack ! Love it. It reduces swelling and dark circles for my allergic eyes. I'm an Optician so I'm very particular about eye products. The ingredients and over all effectiveness of this compress are the reasons I'm now recommending this to patients who's eyes are irritated by dryness or contact wear. I have allergies and this season has been especially bad. Eye Revive is a wonderful soothing adjunct to my allergy eye drops, calming my orbital area and making it easier to sleep. I just wish there was a larger package available with a bit lower unit price, as I would like to use it more often. Love it - very effective. I have the puffy, dark tired eyes of a mom with a preschooler AND too many hours looking at spreadsheets for work on the computer. I've only used Eye Revive a few times and it definitely reduces the tired look (if only it were permanent). If I had only one complaint, it would be clearer instructions - use as needed? Every night? In the morning? I use it at night, even though the effects are temporary it helps me relax before going to sleep. Divide one cosmetic pad in half to make two circular pads. Twist the top from one ampule and split contents equally between both pads. Place over closed eyelids and allow preparation to work for ten minutes. Ampules with any remaining solution should be discarded after opening. Suitable for people who wear glasses or contact lenses and people who suffer from hay fever or work regularly at a computer. For an especially soothing care ritual, treat yourself to Eye Revive when using any of our facial masks.